Last week we teamed up with GatorSnap.com for our weekly giveaway and today we are ready to announce our winners! 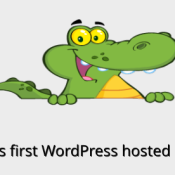 GatorSnap.com offers an easy to use fully hosted WordPress ecommerce solution,WooCommerce is used as the ecommerce functionality. That also includes full eBay integration which is provided by WPLister, with whom they have made a licence deal for usage. This week’s partner for our giveaway is GatorSnap.com. This is an interesting new service that provides WordPress hosted ecommerce. It’s the first such service I’ve heard of, and it will be interesting to see how they do. GatorSnap.com are offering a 1 year subscription to two lucky WP Mayor readers.